Filmmaker Kevin Epps stands outside his childhood home in the West Point neighborhood of Hunters Point on March 9. Photo by Melissa Burman. Kevin Epps grew up in the West Point projects of Hunter’s Point. As a kid he would look out his window at the spectacular view of the Bay Bridge and the ships that cruised beneath it, fantasizing about where they were going. Today, Epps has stamps in his passport from Brazil, Canada and Europe. It was his first full-length documentary from 2003, “Straight Outta Hunters Point,” that landed him in film festivals all over the world. Now, almost a decade later, Epps decided it was time for an update. He filmed and produced “Straight Outta Hunters Point 2,” which premiered worldwide in June of 2011 and is currently showing at the Roxie Theater in the Mission District March 15, 17 and 18. Epps decided to do film “Straight Outta Hunters Point 2” because he wanted to highlight the positive changes that have happened in the neighborhood, like the addition of a Muni rail and the community garden, while also bringing awareness to the problems that still exist. But most importantly he wanted to give the people living in the community a chance to speak their minds. Epps’s documentary portrays the harsh reality of what life is like in this often overlooked neighborhood of San Francisco. Violence, drugs, gentrification and pollution are some of the most pressing issues facing the Hunter’s Point community, all of which Epps witnessed firsthand through out his childhood, teenage years and as an adult. He was raised in a single-parent home, until his mother became addicted to crack and he was forced to live on the streets. 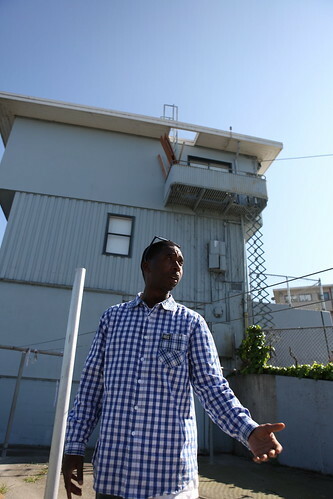 Through the power of education at various institutions, including some classes through Project Rebound at SF State, Epps was able to acquire the skills he needed to make his documentaries. He humbly takes the praise for his films and hopes they contribute to the betterment of a community in desperate need of help, in particular the youth. He hopes his films can inspire them to work hard for a better life. According to a recent survey by the Hunter’s Point Family, a community youth organization, 100 percent of youth in the neighborhood know someone who has been shot and 83 percent know someone who has been killed. In the first, during a time when rappers were a primary force behind gang violence, Bowen appears as a hip hop producer, and in the second he briefly comments on his gratitude that he is still alive and out of prison. Youth of from elementary to high school age can been seen in both films smoking blunts, flashing guns and shooting dice with their older friends and neighbors who they look up to. Violence among them is a cycle that community organizations like United Playaz are fighting to break with conflict management, after school programs and by teaching leadership skills. The exterior of the United Playaz clubhouse in SOMA is decorated by a mural the youth painted. It features the faces of people who inspire peace such as Mother Teresa, Ghandi and Epps, who was voted to be included by the youth and other community members. Rudy Valintino, executive director of the group, described Epps as an unsung hero and a modern day prophet. He believes the “Straight Outta Hunters Point” documentaries can make a difference for the community. 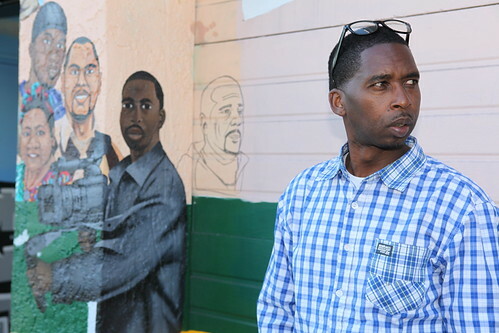 Filmmaker Kevin Epps stands by the mural depicting Epps on the outside of the United Playaz building downtown on March 9. Photo by Melissa Burman. REVIEW: Will Ferrell delights in new film "Casa de mi Padre"
I am so excited that you continuously keep our community on the map. Keep up the awesome work!!! A true soldier to the cause of equity and truth!